On the advice of the Fine Arts Sub-Committee, the Organizing Committee commissioned five artists to submit designs and in June, 1954, the Organizing Committee accepted the selection recommended by the Fine Arts Sub-Committee. It was the work of Mr. Richard Beck, an English industrial designer who had settled in Melbourne. A departure from the illustrative or symbolic designs previously favoured for the Olympic Games, it was a simple clean-cut design showing a white 3-leaf invitation card half-folded and standing out from a bright blue background. 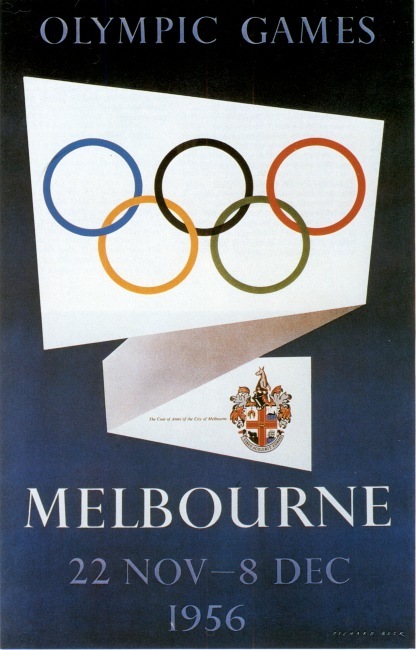 It carried a reproduction in color of the Coat of Arms of the City of Melbourne on the rear fold and the 5-ring Olympic symbol on the front. The poster was printed in two standard sizes-40 inches x 25 inches and 20 inches x 12½ inches. Seventy thousand copies were printed-35,000 of each size. Supplies of posters were sent to shipping companies, airlines, travel and tourist organizations, banks, sporting bodies and National Olympic Committees. Every Australian overseas office acted as a distribution point. The Australian National Travel Association alone, under reciprocal poster agreements, sent 15,000 posters abroad for display on overseas railway hoardings. Through the Australian News and Information Bureau in New York, arrangements were made for thousands of posters to be displayed in retail stores. Under arrangements negotiated by the Press Department, the official poster was displayed in Australia by all airlines, by travel agencies, by the railways in every State, and in every post office in Australia. Sporting clubs, retail stores and small shops also showed it. Circulars were sent to every town clerk or municipal clerk in the Australian States with samples of the posters, seeking their co-operation in arranging for the poster to be displayed in their towns. Excellent results followed.